Its taken me a few days to finally get around to writing up a summary of this year's Great American Beer Festival. I needed some time to recover and return to a more normal lifestyle again. The full list of winners is available at the Great American Beer Festival website. We arrived on Wednesday and after checking in to the hotel and convention, we headed down to the Wynkoop Brewery for the brewers gathering. Its almost like a mini festival with beers from various breweries available at different stations spread around inside. Since its industry only, its a great opportunity to chat with other brewery folk and you always run into people you haven't seen since last year's festival. Once that started to wind down, we wandered over to the Falling Rock Tap House which was a complete madhouse as it usually is during the festival. Its a great place to have a beer, just not during the GABF. However, we fought our way up to the bar and grabbed a few beers (always get two at a time, you don't want to wait again). I also got the chance to meet Amy and Tim Brady from Here For The Beer website which has some great video coverage of the festival. On Thursday was my annual "Rock Bottom Summit". Basically, every year on the Thursday of the convention week, I meet some friends from Denver at the Rock Bottom Brewery for lunch... and typically stay for about six hours. An amusing story that a friend likes to tell is that one year he called me shortly after I got to the Rock Bottom to say that he was driving to the Houston airport to catch his flight to Denver. And when he finally arrived in Downtown Denver, we were still at the Rock Bottom. The festival opened that night and I split my time between wandering the booths to sample winners from last year and pouring beer samples at our booth. Independence Brewing had its first booth at the GABF convention this year and it was fun talking to people about the brewery and the beer. Lots of current and former Austin residents came to chat as well as those who just know someone in Austin and wanted to say hi. The convention hall was larger this year and although there were all the same long lines at all the same booths, it was a lot easier to walk around inside. Friday was another big day with several great events. Every year there is an industry event held at the Sandlot at Coors Field. The Sandlot (renamed to Blue Moon Brewing Company at the Sandlot) is basically a R&D brewery for Coors and is the place that developed Blue Moon and other variations of the Moon brand. Each year the brewmaster picks a particular style and brews different distinct versions of it. This year seemed to be Pilsners, but there were other styles available as well including some rauchebiers. We couldn't stay for all of it this year as a couple of us had tickets for the Rare Beer Tasting that afternoon (wrap-up of that in a separate post). After the Friday session wrapped up, we met-up with a few other Texas brewers and wandered down to the Great Divide Brewery and had a few beers while they were closing up for the night. Great Divide has really grown and expanded over the past few years and continues to put out some really great beer. We caught a cab back to the hotel and decided that some food was probably a really good idea. Unfortunately, not being from Denver, we had no idea where to get food after midnight in downtown. Otis noticed someone carry a pizza box for Mary Jane's Pizza which indicated they delivered from 11:00pm to 4:20am. I can't say that it was very good, but no one really cared or noticed at 3:00am. We were a little slow to get going on Saturday morning. The drinking and standing around for hours and hours on concrete floors at the convention center and bars was starting to wear on everyone. However, this was the day the winners were to be announced so there's always some level of excitement about a potential win. The Saturday afternoon session is usually a little calmer then other sessions. A lot of people are here to watch the results being announced, so its typically quiet around the booths until the ceremony is over and there's a rush to visit the booths that got a win. Independence Brewing didn't get a win, but we got great feedback at the booth as people sampled the beer. The Stash IPA and Convict Hill Imperial Oatmeal Stout where very well liked. The Freestyle Wheat was always popular towards the end of the sessions as people were getting burned out on sampling heavy beers and wanted something light and refreshing. I had a quick nap and a bite between the afternoon and evening sessions. This was the first Saturday evening session that I had ever attended. I usually skipped the last session, opting for a quieter evening at a local restaurant or bar instead. However, the rest of our group had to head back to Austin that afternoon, so I stayed around to wrap up the booth and pour beer for the thirsty masses. It was surprisingly very busy and not nearly the large "drunkfest" that I had always heard it was. By the Saturday evening session, all the popular and winning beers are typically long gone, but that's not to say that only bad beers are left. There are still hundreds of great beers to sample, you just may not get your first choice. When it was finally over, I made my way back to the hotel and collapsed on the bed, not sure if my feet were still attached to my legs or not. For me, the GABF is not simply about drinking lots of different beers (although, its obviously a big part of it), its the overall atmosphere of being in place with so many great beers and people who are enthusiastic about those beers. Everywhere you go, people are enjoying good beer and talking about it which I'd say is the overall goal of the festival. If you've never been, I highly recommend going. If you want to start planning now, the 2010 Great American Beer Festival will be Sept 16th ~ 18th. 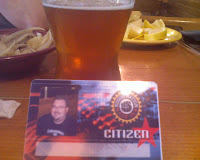 I'm off to Denver and the 2009 Great American Beer Festival. I also have tickets to the Rare Beer Tasting and I'm definitely looking forward to that as well. I will attempt to post updates during the week, but the Twitter feed will probably be a better source of what we're up to. If anyone wants to get together in Denver, post a reply in the comments. Cheers! 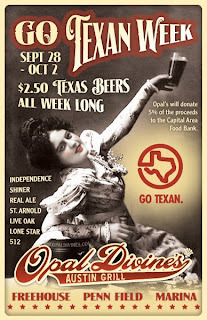 As part of the Go Texan Restaurant Round-Up, all three Opal Divine's locations in Austin (Freehouse, Penn Field and Marina) will be serving $2.50 pints of Texas-brewed beer from Sept 28th to Oct 2nd. The full list of the Texas beers being served is available here and includes the new Oatmeal Stout and Stash IPA from Independence Brewing. The Go Texan Restaurant Round-Up is sponsored by the Texas Department of Agriculture to promote restaurants and chefs who are dedicated to serving fresh local ingredients. Participating restaurants will be serving special Texas menu items during the week and many will also contribute a portion of the day’s proceeds to food banks across the state. More information, including a full list of participating restaurants is available here. It's International Talk Like A Pirate Day, me hearties! Shiver me timbers, it be International Talk Like a Pirate Day! Although Captain Jack Sparrow seemed to favour the rum, I'm sure pirates drank plenty of beer while pillaging and plundering. So unleash yer inner buccaneer while quaffing a few pints of grog in the local pub. 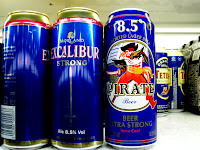 A quick google search only returned two "pirate beers" and neither are available here. 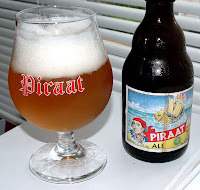 Any suggestions for other pirate related beers? The GABF is great, but what else is there to do? You're in Denver for the Great American Beer Festival, but what do you do when you're not wandering from booth to booth on the convention floor during one of the tasting sessions? Seek out more beer to drink, of course. Denver is one of the best beer cities and there are a plenty of breweries, brewpubs and beer bars in the area to visit. If you want an easy way to find everything and see it on a map, check out the City Beer Map for Denver and surrounding area on The Beer Mapping Project website. If you have a car and a designated driver, you can also make a short road trip out to Fort Collins (New Belgium, Odell Brewing Company, Fort Collins Brewing) or Longmont (Oskar Blues Brewery, Left Hand Brewing Company) or Boulder (Avery Brewing Company, Boulder Beer Company, Mountain Sun Pub and Brewery) to name but a few places. Anyone have any additional suggestions to mention?? View an interactive map of the festival. Review details about breweries and events. Filter brewery listings by Location, Judge Only, and Small & Independent! Sort events by popularity, time, and name. Registered users can indicate which events they are attending. Create a list of breweries they want to visit and their booth numbers. Add an event, like a book signing or seminar, to their unique schedule. Schedules can be printed and/or exported to iCal or Outlook. Leave comments for breweries and about events. Post comments for other registered users to see. Send messages to other registered users. I've created a profile, but I haven't played around on it too much yet. 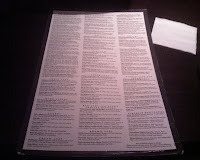 Looks like its got some pretty useful tools such as the ability to create a list of the brewery booths you want to visit. Its only 10 days until the festival begins, so its good time to starting planning your time in Denver. Is that the Rogue Brewery down there? "Is that the Rogue Brewery down there?" "What? Where? I don't know." "Looks like it. It says Rogue on the roof and there's a lot of big tanks around it." Latona 20th Anniversary Ale - An American Strong Ale, it was brewed in honour of the first draft account for Rogue in Seattle. Its brewed using only one malt (a special aromatic malt from France) and one hop (a new variety of Mt. Rainier hops). Sesquicentennial Ale - Brewed in honour of Oregon celebrating 150 years of statehood and designed to showcase Oregon-grown Ingredients. I really enjoyed this one and picked up a bottle of it to bring back. Menage a Frog Ale - A Belgian Style Trippel that is actually brewed at the Issaquah Brewhouse in Seattle which was acquired by Rogue Brewing in 2000. It was fantastic and I bought a bottle of this to bring back as well. As far as the food goes, I had the best fish and chips that I've ever tasted. The fish was moist and juicy with a light batter that had lots of dill mixed right in it. I think it may have ruined me for any other fish and chips. 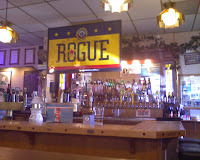 At our server's insistence, I joined the Rogue Nation which then got us a discount on our bill as well as on the bottles of beer I bought to take home. In addition to the Menage a Frog Ale and Sesquicentennial Ale, I also brought back a bottle of their Smoke Ale. I had no idea they even made a Rauchbier. We can buy their Chipotle Ale down here and I often pair it with barbecue, so I'm looking forward to doing the same with their Smoke Ale. I could have easily spent the rest of the afternoon working through the list of their beer, but we had more beautiful Oregon coast to see as we made our way up to Cannon Beach for the night. Portland (and Oregon in general) is one of the best beer places in the country (if not the best). There are over 35 breweries in the Portland metro area and over 90 in the state. A few of them are located in the downtown area, but the rest are spread around and not easily accessible by public transit. My wife mentioned that I was interested in the beer scene in Portland while we were talking to the concierge after checking in at our hotel and she mentioned the Saturday afternoon Brew Bus tour. My wife was interested in wandering around the art festival and the Pearl District that afternoon and strongly urged me to go. I took the hint and a quick phone call later, my wife was dropping me off beside a school bus next to a guy with a long grey ponytail and wearing a shirt with beer mugs all over it. This was Jim Long, the tour guide as well as local historian, author and inventor of the blue pages in the phone book (for those who remember what a phone book is). There was 24 of us on the bus, not including Jim and a first-time driver of the tour bus who spoke broken english and didn't know his way around Portland very well. The tour lasted 5 hours and we managed to visit 4 breweries, an average number, Jim said, based on the size of the group. As we drove between breweries, Jim entertained us with stories of the local brewing scene, historical facts about the area and general beer knowledge. Lucky Labrador Brewery - We visited the beer hall location which is in an old Freightliner Trucking warehouse. Its essentially just a huge wide-open space with long rows of tables and chairs. Their beers were all generally good, but nothing that particularly stood out from the rest. However, this was our last stop and we were pretty much rushed through the sampling in order to get back in time. Overall, I'd have to say that Hopworks Urban Brewery was the definitely the winner of the day. They had a good variety of styles on tap and I genuinely liked all of their beers that we sampled. Although busy, the brewpub looked liked a cool place to hangout and it actually reminded me of Austin (probably from the whole organic and green vibe they had going). I would definitely recommend it and I'd probably try to get back to it the next time I'm ever in Portland.